The DAR Project Patriot Committee is an official Daughters of the American Revolution committee that supports America’s service personnel in current conflicts abroad. This committee was officially started following the events of September 11, 2001, when the NSDAR began working the Department of the Navy to Sponsor the crew of an aircraft carrier to show support of Operation Enduring Freedom. The Sallie Harrison Chapter has a long history of supporting our Active Military. The Sallie Harrison Chapter is passionate about supporting our active-duty military. 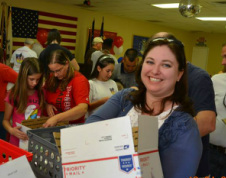 Currently, the Sallie Harrison Chapter partners with local organizations, including K.I.S.S Kids and the USO of Central Florida, to continue support our active military men and women. K.I.S.S. is a program run by children, with the help of some adults, which want to make a difference in a soldier’s life no matter what state they are from, or what branch of service they are in. Each month a package is sent to a particular solider and includes a message by children with love and appreciation for what the soldiers are doing for our freedoms. The Sallie Harrison Chapter supports this program through regular donations of items for our troops, packing boxes, and monetary donations. K.I.S.S. has also been awarded a Community Service Award for outstanding service in patriotic community endeavors. For more information on this program, please check out the link to their website on our Outreach page. The mission of the USO of Central Florida is to lift the spirits of troops and their families and that mission is accomplished on a daily basis thanks to the dedication and generosity of the American people. The USO Welcome Center at Orlando International Airport (MCO) is USO Central Florida's newest project and will welcome our service men and women, as well as their families, sharing a touch of home with them in their journey.